A client of mine has asked me if it would be possible to run pfSense as a Microsoft Azure IaaS Virtual Machine. pfSense® software is a free, open source customized distribution of FreeBSD, specifically tailored for use as a firewall and router that is entirely managed via web interface. At that time, I had in mind that running FreeBSD 10 under Hyper-V and in Microsoft Azure, is something that can be done. So, I decided to build a deployment as a Proof of Concept and to write a blog post about this deployment. 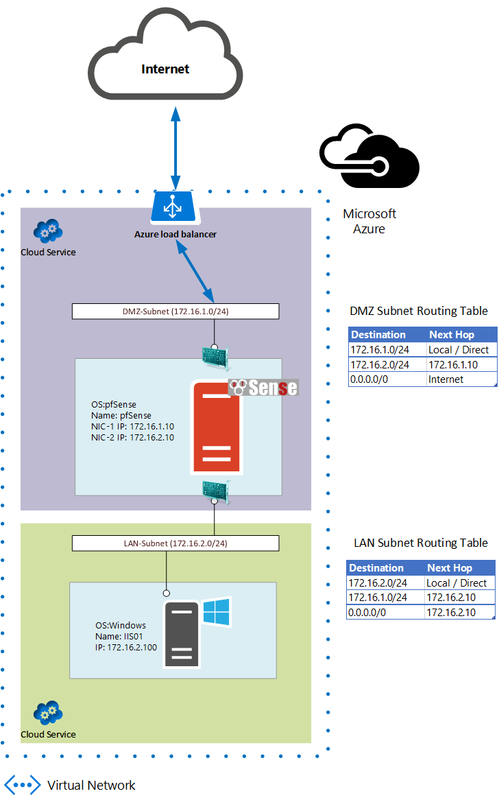 This post will provide instructions and all the necessary steps to prepare, upload and run pfSense-2.2.3 in Microsoft Azure. Please note, that FreeBSD is not currently an endorsed distribution in Microsoft Azure and therefore is not supported. The process will require 67 MiB more space. Typically on Azure, root account is disabled and we using uprovileged user to login. An unprivileged user should utilize sudo to run commands with elevated privileges. 796 KiB to be downloaded. Version 2.0.10 or later is required for FreeBSD. Branch 2.0 is typically very stable and as of July 2015 the latest version is 2.0.14. Connecting to raw.githubusercontent.com (raw.githubusercontent.com)|185.31.17.133|:443... connected. Configure WAN (hn0) Interface as DHCP client. 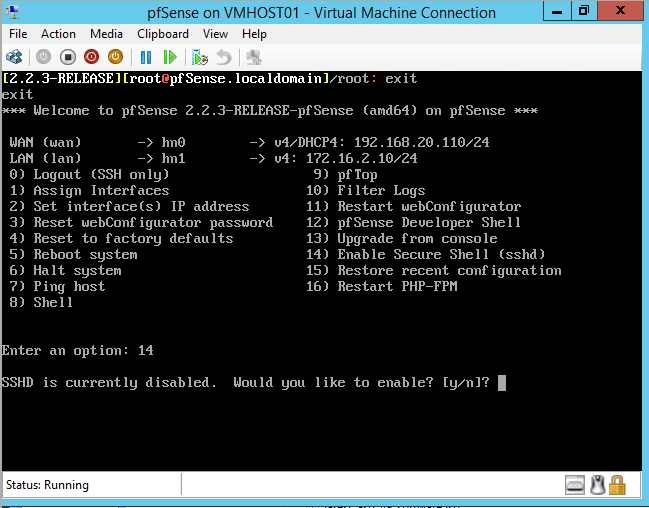 Now the pfSense Virtual Machine is ready for running in Microsoft Azure. $SourceFile = "C:\Hyper-V\pfSense\Virtual Hard Disks\pfSense-2-2-3.vhd"
Note that we are using OS type Linux instead of FreeBSD as it is not currently supported. With user defined routes, we have complete control over the traffic flow in our virtual network. Virtual network by default provides system routes for traffic flow between virtual machines. Now, we can customize the routing table by defining routes and that is allowing us to direct traffic through pfSense Virtual Machine that we have just created. Routes can be defined inside a routing table and applied to subnets. Every VM within a subnet automatically inherits the routes from the routing table. The pfSense Virtual Machines must be able to receive incoming traffic that is not addressed to itself and this is the reason to enable IP forwarding. I noticed the twitter post saying the pfsense say there are some serious shortcomings with this setup; do you know what these are and are they insurmountable and should we wait for the official image? I didn’t notice any serious or insurmountable shortcomings. This procedure has led to a production environment, that is working perfectly until now. However, an official image that is engineered by Microsoft and pfSense teams together is always better. Do you have any information on setting up the load balancer to forward all traffic instead of having to build a million NAT rules from Public IP > Front end IP of PF sense followed by the same rules passing traffic to the server vnet? Azure Load Balancer will do port translation and load balance the network traffic, by leveraging the public IP address for the cloud service. In the classic deployment model, port translation is done through endpoints that have a one-to-one relationship between the public assigned port of the public IP address and the local port assigned to send traffic to a specific virtual machine. Another way to access an Azure VM is the Instance Level Public IP (ILPIP) which is a public IP address that you can assign directly to your VM or role instance, rather than to the cloud service that your VM or role instance reside in. Please keep in mind that ILPIP is an IP directly assigned to an Azure VM without any protection like firewall, DDOS etc. This is correct. You have to create an Endpoint for each port you want to forward to pfSense and then create a pfSense rule to allow the traffic to this port. Using Powershell for Endpoint creation will simplify the process on Azure side. So this essentially almost provides you a double tier FW for free almost. The official PFSense version do not deploy correctly and with an A3 or D Series VM (to allow multiple NICs) the setup gets costly quick. @Vaggelis, would you mind to update the guide für the new Azure Portal / Azure Resource Manager? I am trying to follow your guide and using Input from here: https://github.com/Azure/azure-quickstart-templates/blob/master/201-specialized-vm-in-existing-vnet/azuredeploy.json but the PFSense VM is not spinning up. The HDD remains a 0 Byte disk and at the end the deployment times out. Sure, actually is on my plans first to update the guide, in order to be valid for the Azure Resource Manager model and then to write a new blog post about how you can use a single NIC VM to protect your Azure Virtual Network. @Vaggelis, thanks a lot for your guide. I would second Christian’s request. Cheers! Unfortunately I am having issues installing the Azure Linux Agent as wget or fetch commands are unrecognized by pfsense. 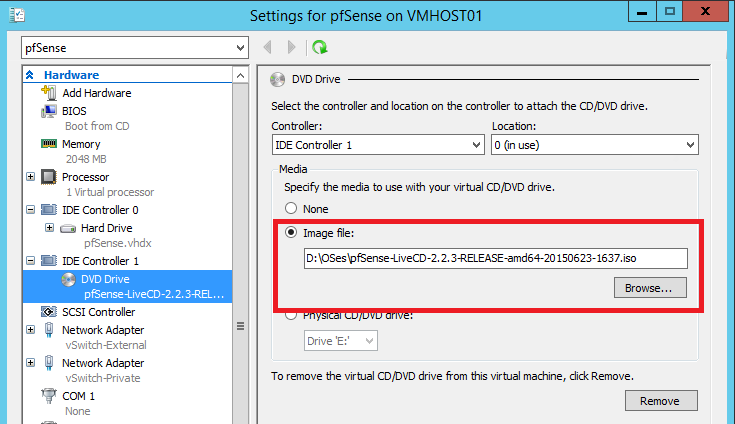 I am running the pfSense version 2.3.2 using Hyper V on Windows Server 2012. I was able to install python and sudo but azure linux agent has proved to be tricky. Any suggestions?